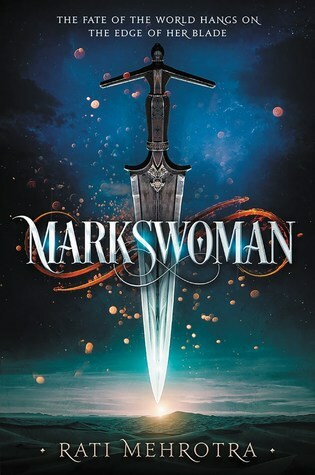 Markswoman is the first book in a planned duology and I absolutely loved it. It takes place in Asiana many centuries after the Great War. There are several orders which protect the land from crime and outlaws, and Kyra is part of the Order of Kali. The book is mostly told from Kyra's point of view, but it does occasionally flip to Rustan -the love interest's- point of view. I liked this as I always find it interesting getting a glimpse inside the love interest's head. Kyra is 19 and Rustan is 21, I think, which is quite unusual for YA. It does, however, give it a cross-over appeal. The world building in Markswoman was well done, there was enough of it to get a general picture of what the world is like like, but it also leaves you with a desire to learn more - especially about the past, which I'm hoping will be explored in the sequel. Kyra and Rustan were both complex and likable characters, and I found myself easily rooting for them. I liked that Kyra didn't excel at everything, and that she struggled as it made her more relatable. I also enjoyed Kyra's friendship with Ninthe and Elena, and after a certain scene involving one of them am intrigued to see what role they will play in the sequel. Something I found refreshing was the role of women and men. In this world women are in power - all the Orders except one, the Order of Khur, is made up of women. "Mere men, sitting here as if they are our equals." "Men wielding kataris, it's a disgrace." The only thing I disliked about Markswoman was how rushed the romance was. As I mentioned I adored both Kyra and Rustan, and I was fully ready to start shipping them. The problem was, however, that there was no build up or tension between them. They meet 40% into the book and after a month they're suddenly in love having had only one real conversation (at about 63%) that wasn't about training. It just wasn't believable. Overall, a great read and I can't wait for the conclusion! So glad you enjoyed this one! I also liked the roles of men and women in this world and felt the same way about the romance. It just didn't fit. Great review! I have this book on my TBR! Glad you liked it!